Edwin Avila lost his saddle in the run-in to the stage 3 sprint in Colorado, but snatched runner-up honors anyway. 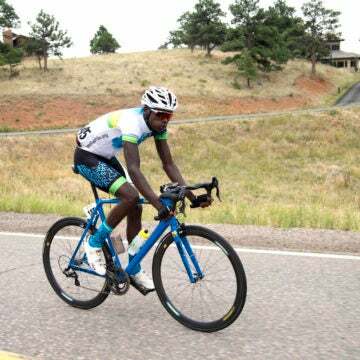 Edwin Ávila (Israel Cycling Academy) was hoping for more out of stage 3 at the Colorado Classic, but it’s hard not to be impressed with his second-place ride, considering he sprinted across the line in Denver without a saddle. That crucial piece of equipment somehow came detached and fell off at some point in the stage finale. “I didn’t crash or anything. I was watching the video yesterday to see how it might have fallen off, but I didn’t see. 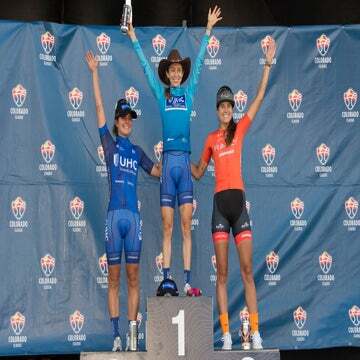 I have no idea how it happened,” Ávila told VeloNews. Ávila says he still had his saddle as he was heading into the finale, one of the favorites to battle for the stage win. Somewhere in the run-in to the last kilometer, however, it fell off his seat post. The timing was not ideal. He could have pulled the pin on fighting for the sprint right there, of course, but Ávila decided to give it a go anyway. After all, his teammates had put in a lot of work all day to set him up. Sprinting without a saddle was a unique challenge, and one Ávila is not interested in trying out again any time soon. Ávila finally got his chance to rest his behind after rolling across the line and winding down the sprint, but he says he was too busy being bummed with second place to enjoy the relief. Fortunately for Ávila, he should get another shot Sunday in stage 4. The circuit for the Colorado Classic’s Denver finale has a few lumps, but most in the peloton expect a sprint finish. Assuming everything goes to plan, Ávila will be back in the mix at the end of the day, hopefully with a saddle this time.